The silk comes directly from China. I had plenty of time to wait, wondering if I was just buying yet more rayon. Eventually a small packet arrived containing a plastic bag of threads, knotted in bundles. Just from the feather-lightness of the packet, I could tell that it was real silk. 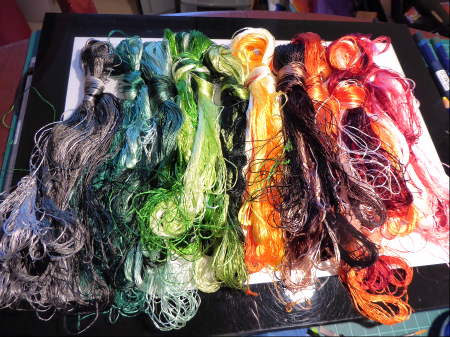 It was a squashed-looking muddle in the bag, but it was easy to separate the heap into ten big knots, each containing about eight smaller skeins of silk in different shades of the same colour, usually from a very light to a very dark dye. As the silk relaxed, so did I – it is beautiful. These small skeins can be cut across once to give metre-long lengths which can be cut again to give a useful working length. Each skein has over 20 metres of silk, and the thread itself is a loose two-ply twist, each ply being made of eight finer strands. This packet had about eighty of these skeins. Splitting a length of silk into the two main plies is very easy. (Splitting the plies down further into eight cobwebby strands is very, very much trickier. I can usually get a ply to divide down to two lengths of four strands, with care. After that it’s a toss-up whether I get one, two, three, or just a useless tangle – I am improving slightly with practice. Fortunately, I will rarely want to use less than one of the two main plies.) I usually separate the two main plies, let them untwist and then recombine them to give a nice smooth working thread. If I want thicker silk, I can combine more plies. Here’s a comparison shot. The top two stands are the Chinese silk, as it comes – not separated. (The coloured stitching above has been done with this undivided silk.) Below that are two strands of DeVere 06 (that’s the bobbin on the right) so you can see how smooth and fine it is. The black outlines are stitched with one strand of it. At the bottom is a single strand of ordinary stranded cotton as a scale reference. As a rough comparison, two plies of Chinese silk are equivalent to three lengths of 06. The Chinese silk is a lot more ‘lively’ than DeVere’s smooth, well-behaved silk. It just loves to catch on things, tangle, muss-up and generally go where it feels like going. The main attraction is the sets of tones, which are wonderful for smooth shading. (Combining plies of two different shades gives even more subtle changes of tone.) It also has good covering power. 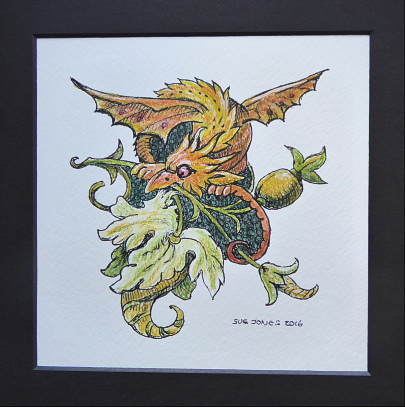 You may remember the little wyvern I did as an ink and colour drawing. I originally intended to use this for an embroidery design, but was so happy with how it worked as a drawing that I’ve only recently got around to working it in silk. This started with outlining, using two strands of DeVere 06 silk, some of it is split stitch and some stem stitch. I then started filling in the outline with colour. The coloured areas are a mixture the Chinese silk and DeVere silk – generally DeVere was used for the finer details and Chinese silk for the rest. The fabric is 440 count Egyptian cotton from Empress Mills, stretched very tightly in an 8-inch hoop. 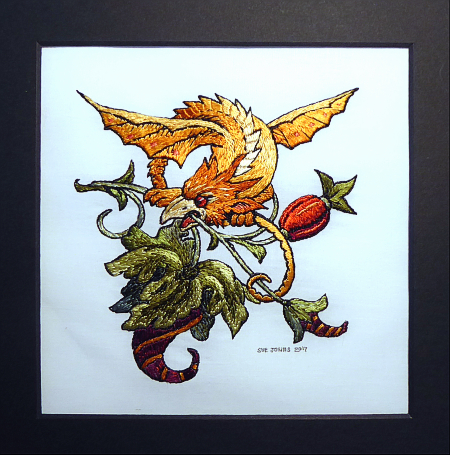 The finished piece is in a 6 inch square mount. Barring a tiny bit of practice stitching, this was my first attempt with the Chinese silk. 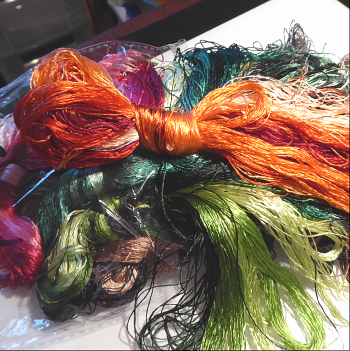 I’ve since added a lot more colours of the silk to my stash, so it won’t be my last. This Chinese silk won’t replace DeVere 06, which is so good for fine, neat, detailed stitching. But it is a great addition to my ‘toolkit’ of threads for silk-shading and for covering larger areas in gorgeous colours and sheen. Have any of you discovered any new threads recently that you want to tell us about? Have you tried Chinese silk? Any thoughts, tips or hints on using it? Oh, by the way, I shall be away from home for a few days, so if your comment doesn’t appear or doesn’t get a response: please be patient. I won’t have much chance to go online. Normal service resumes in July. This entry was posted on June 20, 2017 at 1:07 pm and is filed under Embroidery, Needlework with tags China, Embroidery, silk, thread. You can follow any responses to this entry through the RSS 2.0 feed. You can leave a response, or trackback from your own site. It is a most lovely sheen, Kathryn, and there are some stunning colours. I was fortunate that I had done a fair bit of stitching with filament rayon before I started on filament silk. Rayon is so much more of a nuisance to stitch with that DeVere silk came as a very pleasant surprise! The Chinese silk is not quite so well-behaved as that, but no worse than rayon at its most annoying. I guess it stops life becoming predictable, Rachel. Often it’s staple length that makes the difference (nasty short bits of linen or cotton will make nasty threads – dear manufacturing company that shall be nameless, please take heed! ), but with filament silk and rayon, it probably the processing wot does it. DeVere seems smoothed out and stretched, obviously prepared for spinning into thicker yarns (for instance their 60 thickness is a soft single twist of ten lengths of 06, no more no less). You gain in manageability while you lose in ‘spreadability’. Short staple wool can make a good yarn, but it will be fluffy and not great for embroidery. Processing, dye, and even the ambient temperature will make a difference to the way a thread behaves, as well. 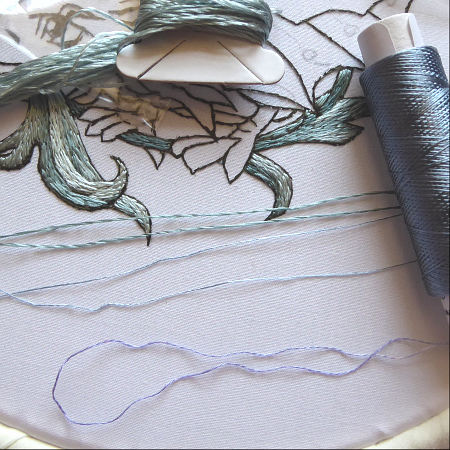 And the more embroidery you do, the more aware of it you become…! The colours are knockout, Jessica, aren’t they? And a good mixture of the very bright and the very subtle, too. According to what I’ve read, in theory one should get eight strands from one main ply, but I haven’t really needed to go that fine yet. I would probably waste a lot of silk in the process of learning the knack. The Margaret Lee course must have been excellent, I am rather jealous!